The Jaguar company had gone through some trying times in the 1970s and apart from regular upgrades of their only saloons, the XJ6/12, had not produced an entirely new car since 1968. Even after the introduction of the last version of this model, the Series 3, the company was still experiencing problems in build quality, the cars being produced by out-dated manufacturing methods which also made them too costly to build. At least some of these problems must be laid at the feet of British Leyland. Jaguar had, however, been working on a new replacement saloon as far back as the Series 2 XJ - in fact, small-scale models had been produced as early as 1972. With so much energy being absorbed by the development of the existing XJs and the upcoming XJ-S, the 'new' project (code named XJ40) was not given the priority it deserved. Jaguar was also hampered by continuous interference from British Leyland, which at one time actually considered using the Rover V8 (ex-Buick) engine in the new car, which would have meant the end of engine production at Jaguar. Just as Jaguar had approached Pininfarina regarding the restyling of the Series 3 XJ, they also encouraged them - and other Italian designers - to put in proposals for the new car, none of which proved suitable. It wasn't until just before John Egan arrived on the scene at Jaguar that BL actually approved a £32m investment in a new engine (the AJ6, first seen in the XJ-S in 1983). It wasn't then until 1981 - more than three years after the Series 3 XJ had been announced - that the Board agreed to a further £80m investment in the XJ40 project after finally agreeing the exterior design from a glass fibre mock-up. It appeared that speed was of the essence by this time and the money was approved on the undertaking that the XJ40 would be ready for launch by 1983. This was never a practical deadline and in the meantime it was fortunate that Jaguar's image improved dramatically, leading to an upsurge in sales of its existing models. This gave the company more time to develop the XJ40 into a better car. Deadlines came and went and it wasn't until the British Motor Show of 1986 that the XJ40 finally arrived, with two engine sizes (2.9-litre car), two styles of trim, and a Daimler-badged model. The XJ40 brought Jaguar up to date with all-new technology, being electronically the most technically advanced car in the world at the time (bar the ill-fated Aston Martin Lagonda). It was also quicker and cheaper to produce, more economical to run, and therefore the most significant new model since the original XJ6. Despite all that was 'new' with the car Jaguar decided to call it XJ6 again, though it was and still is widely known by its XJ40 factory code-name, which conveniently distinguishes it from its forebear. Due to demand and other practicalities the XJ40 wasn't launched in the US until 1987, by which time it was already proving to be a great success in the UK market. Some Series 3 XJ6s had trickled through until April 1987, and Jaguar ended up with a two saloon model line-up in that the V12-engined Series 3 models would continue on into the early 1990s. 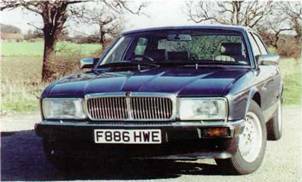 The XJ40 model range was tight but effective, even if many people considered the smaller-engined 2.9-litre car to be under-powered. This was eventually replaced in 1990 by a 3.2 version of the larger unit, which itself was enlarged to 4.0 litres in 1989. 1988 and 1989 proved to be momentous years for Jaguar because it sold more cars then than it had ever done before. Most of this was down to the XJ40, which sold 39,432 units in 1988 and 32,833 in 1989, the 40's best ever years. Although exactly the same bodyshell was used for all XJ40 models, numerous changes ditterentiate each car. The standard XJ6 models all featured the four headlight treatment and plastic hubcaps on steel wheels. XJ6 models also used powder-coated black window surrounds as depicted here. As the original bodyshell of the XJ40 had never been designed to take the big V12 engine (a throw-back to Jaguar personnel deliberately 'engineering out' any chance of getting the Rover V8 in! ), a V12 XJ40 didn't arrive on the scene until 1993, by which time the old Series 3 models had disappeared. Top of the range Sovereign and Daimler models featured rectangular headlight units and chromed window surrounds. Jaguar had long been known as an 'old man's' car, and in order to redress this situation the XJ40 tried to capture a younger market with its Sport model of 1993-4. Relatively subtle changes to exterior and interior had a slight effect, but only just over 3,600 were actually sold. Jaguar also got concerned about sales late on when there was public awareness about a replacement model for the end of 1994 (the X-300). For that last year, therefore, it announced yet another model, the Gold, offering a high degree of standard equipment at a special offer price. Daimler styling cues involved swage line chrome trims along the entire length of the body, chromed window surrounds as Sovereign, and alloy wheels. Along the way the joint venture with TWR, JaguarSport, produced more sporty versions of the XJ40. A very limited run of long wheelbase Majestic models was also made to order. In the valued US market several special editions were marketed, bringing back the Vanden Plas and Majestic names. During the first year in production the Jaguar Sovereign model featured this black-painted boot panel like the Daimler. The XJ40 was a vital model to Jaguar, coming at just the right time. It saw the company out of BL control, into private ownership, and then into the Ford empire. Although only in production from 1986 to 1994 over 208,000 cars were made, and even the replacement X-300 owes much to the XJ40.